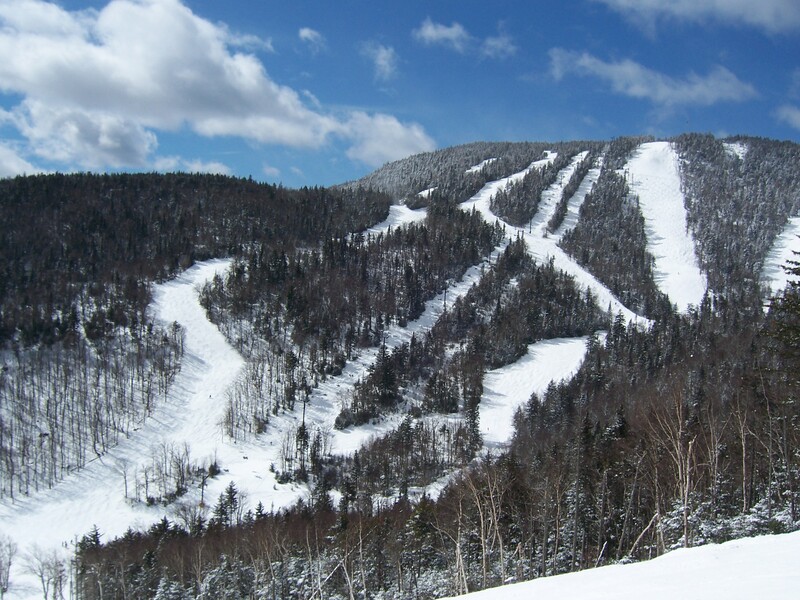 The Gore Mountain Ski Resort has 28 different glades, all with their own unique features and natural wonder. During summer 2017, Gore’s crews completed the most thorough cleanup of the glades to date; you can now find glades on every mountain area of Gore, with trees that send you north, east and south! This means lots of variety, undiscovered pockets of snow and miles of Adirondack trees. With a little help from Mother Nature, this winter will be the best ever for touring Gore’s extensive woods. What follows is a primer on some of your options, along with quotes that provide some colorful commentary by the locals who know these slopes best. Abenaki Glades: This Burnt Ridge Mountain glade is a perfect opportunity to find untracked natural snow in quiet woods away from the hustle and bustle. Use it as a shortcut to the Ski Bowl, or circle back to the Burnt Ridge Quad. Barkeater Glades: Take this glade from the top of the Burnt Ridge Quad to Pipeline Bridge along 3,700 feet of backcountry fun! It’s nice and easy on top, steep and rugged on the bottom, with lots of different lines to choose from. Boreas Glades: This is a long and scenic glade on a wooded landscape, with a few tight trees and a handful of steep spots. It was named after the Greek god of the North Wind and a river near Gore. Sagamore Glades: Test your stamina in this ample glade after some long tours of Burnt Ridge Mountain. It offers an option to cut over to the Gully, or into Cirque Glades. Cirque Glades: Named for its remarkable geology, this glade delivers about every grade of terrain and noteworthy scenery. This trail is the longest glade in the East, so be ready when you venture in! Some flat areas make it ideal for backcountry skiers. Twister Glades: Our oldest glade and still the local favorite! There are many cool boulders along the way and a chance to watch skiers and riders zip down Echo on the other side of the valley. At the end there is some steep terrain as the finale. Chatterbox Glades: Adding some flair to freestyle, Chatterbox runs alongside the Wild Air terrain park. With a few chances to bounce back onto the main trail, this is a lower commitment venture, but still a hefty trip through the woods. Forever Wild: Running between the main arteries of Wild Air and Showcase, this glade offers a little hideaway in the trees where you can hit up some natural freestyle features made of rocks and logs. This line is not your average glade. Otter Slide Glades: With a few little dips and always packed with snow, this trail is great for beginner gladesters, due to its more mellow pitch. Access this cutie right off the Sunway chair. Cave Glades: Explore a cave located halfway down. You can easily grab this glade right from the gondola and enjoy the lush evergreens that surround the journey. Pinebrook Glades: Taking you from Pine Knot to Straight Brook, this is our fourth glade option right off the gondola. You’ll find yourself twisting through trees with views of the summit. The Trench: Gore’s newest glade is like a bobbing and twisting natural rollercoaster, loaded with manmade accents to enjoy. Hint: Toward the end, veer left to exit through the tree tunnel! MacIntyre Glades: This tight glade with steep pitch opens up at one stop to a birch-filled haven. Darby Woods: Our staff’s pick; it’s a fun escape into the meat of the High Peaks forests. Short, steep and usually deep! Dark Side Glades: When you’re ready to show-off your stuff to the experts on the High Peaks chair, they’ll cheer you on as you rip it up! Birch Bark Alley: Slip into this pass off the Cloud trail and pop out on the Woodchuck trail to add some variety to your High Peaks area tour. Chatiemac Glades: This Straight Brook boss has tons of lines that lead right back down to the quad, so you can shoot back up and do it all over again. Mineshaft Glades: Located between Open Pit and Dell on the Straight Brook area, this glade is a hop, skip and a jump to spice up your summit lap. Double Barrel: This is one of the most challenging trails on the mountain. This glade is The Rumor’s next-door neighbor, and this gnarly double diamond will only be black until they come out with something darker. Straight Brook Glades: These glades start quietly off the skier’s left of Chatiemac, but they throw you right into showboat mode to run the bottom of the quad’s lift line. The Narrows: Take the adrenaline route that follows Headwaters to the Straight Brook Quad. High Pines: This is an edgy Topridge tour that’s more about wide turns than tight trees. Check it out from the triple. Kill Kare Glades: A clean country run to make your cruise of Pine Knot so much more interesting. Rabbit Run: Off the Tahawhus trail on the North Side, you’ll feel transformed into a small bushy-tailed creature ducking in and around trees. Tahawus Glades: Grab these super clean and friendly, but also exquisite, glades for some smooth maneuvering. This glade spills out at the base of the North Quad, making it a great transition from Burnt Ridge to the North Side, or onto the Ski Bowl. Local Tip: The North Creek Business Alliance Shuttle runs a regular trip at a particular time up to some of the original “ride up, slide down” trails at the North Creek Ski Bowl. Call 518-480-8907 for more information. There is a small charge, and be sure to tip the driver! Ski Bowl Glades: Marked with a rock table at its entrance, this long venture has steep pitch near the top and open hardwoods throughout. For expert skiers and riders only, you’re all-in once you commit to this monster! Half n’ Half: This small and easy glade is a fun shortcut across part of Little Gore Mountain. JJ’s Glade: A nice low-angled glade with wide spaces between the trees makes this an approachable laid-back glade. It is named in memory of one of our patrollers, who cherished that part of the Ski Bowl’s terrain. ***Are you planning on visiting Gore Mountain for some world-class skiing? Make Alpine Lodge your first choice for lodging in the area. Nestled on the main street of North Creek NY, you will find comfortable, moderate accommodations perfect for winding down after a full day of outdoor activity. Call us at (518) 251-2451 or contact us online for more information. Or if you’re ready, book your stay online with us, today!